The 74.98 metre motor yacht Leander G has been sold with Peter Insull at Peter Insull’s Yacht Marketing representing the owner in the transaction direct to a private individual. Delivered in January 1993 the yacht has been owned by Vice Admiral Sir Donald Gosling KCVO RNR for the past two decades. Built in steel and aluminium by the German yard Peene Werft on the Baltic Sea, she was built under the supervision of Claus Kusch. An English country home style interior by Pauline Nunns accommodates as many as 20 guests in 10 cabins consisting of a master suite, VIP suite, three doubles and five twins, all with en suite bathroom facilities. 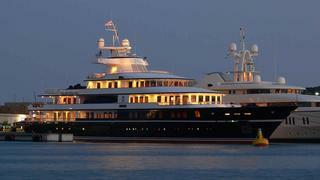 Very quickly, Leander G was acknowledged as one of the great yachts of the 20th century and over the past 20 years she cruised throughout the Mediterranean, Northern Europe and to every point in the Caribbean Sea. Lloyds classed and MCA compliant, she hosted Her Majesty Queen Elizabeth II and Prince Philip on a tour of Great Britain and TRH Prince Charles and The Duchess of Cornwall in the Caribbean, carrying out the informal role of royal yacht to senior members of the royal family on official tours. Leander G will remain the yacht’s name and she will maintain her distinguished blue hull. Captain Jules Cope MVO took over from his brother Giles in July 2005 and will remain in command along with his crew. No asking price has been given for the sale.